On November 7th, a small litter of African Wild Dog puppies (one male and two females) was born at the Oklahoma City Zoo and Botanical Garden to first-time mother Xena. The birth was monitored carefully, due to Xena's inexperience, and unfortunately she showed no interest in mothering the pups. 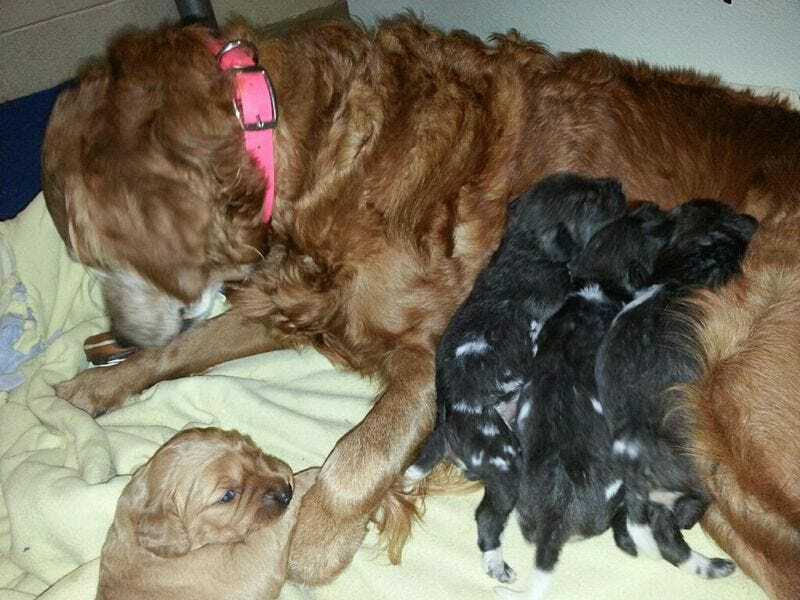 The zoo staff decided to remove the pups, but they needed an experienced mother to care for the pups as a surrogate. They needed a domestic dog who was a proven and experienced mother, good with people and other dogs, and who was currently lactating. Calls were made to animal shelters, rescue groups, and colleagues while the zoo staff searched for a suitable candidate. Lily, a retired search and rescue dog, stepped up to the plate. She had recently given birth to a single puppy in Wichita, Kansas, and she met all of the other requirements as well. Her own puppy is being nursed and raised alongside the Africa Wild Dog pups. In general, it's better for these pups to be raised by a surrogate mother instead of hand-raised by humans, because Lily and her pup will provide much-needed socialization to the pups. Thank you for your service, Lily! I've written about African Wild Dogs in my Wednesday Woof series.